(NY: Crown, paperback. 312 pp. "[A] brilliant diagnosis of the most important issue facing our world: Can democracy survive?” – E.J. 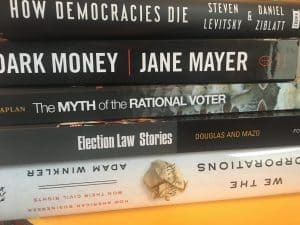 Dionne, Jr.
“Two years ago, a book like this could not have been written: two leading political scientists who are experts in the breakdown of democracy in other parts of the world using that knowledge to inform Americans of the dangers their democracy faces today” — Francis Fukuyama.